Millionaire heiress Dorothy Adams and her father have just arrived in Southampton, England, to seek rest for Dorothy's "heart" condition. Prior to their arrival, she is warned of the eligible bachelors who are "anxious to meet America's most beautiful heiress." When the newspaper reporters greet their arrival, Dorothy makes herself look a "plain Jane" with round spectacles, hair tucked under a bowler-shaped hat and a sour expression when the photogs ask her to pose for a picture. Walking down the gangplank, she trips and falls into the arms of Sir Paul Menford, a young, handsome, English nobleman who is broke and has spent his last dollar on flowers for a returning actress he is awaiting. He assists her innocently enough, but the actress sees this and assumes there is more to the embrace than simply offering assistance. 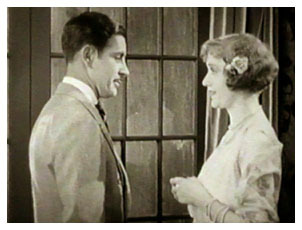 Dorothy though, is visibly smitten by the nobleman, but walks away with her father as Menford receives the icy actress. Suddenly he realizes that Dorothy's watch got caught in his coat pocket, and he runs to return it. By the time he reaches the car, Dorothy has returned to her rightful appearance, and Menford is smitten by her now-revealed beauty. Menford is forced to sell his last asset - his estate - and he arrives at his realtor's office to borrow more money. The realtor, Joseph Diamond, refuses to provide any more loans until the estate is sold. "Why don't you marry a rich young girl?" Diamond asks. "Why don't you find me one?" Menford replies. "I can fix it," Diamond tells him and provides the newspaper photo (sour look and all) of Dorothy. "Get me that girl and you can have 100 percent," Menford says jokingly. Menford gets his loan, but must return quickly to the home of his uncle, Dr. Paul Scott, to fetch his bag which he left on his way out of the country. Coincidentally, Adams sends his butler for Dr. Scott as the only specialist who can help his daughter. When Menford emerges from the doctor's home with what looks to be a medical bag, the butler assumes he is Dr. Scott and hands him Adams' card. Menford recognizes the name and decides to play along. Posing as the doctor, his and Dorothy's relationship blossoms. However, each time he runs into Diamond, the realtor reminds Menford of the 10 percent agreement. Finally, feeling overwhelmed with guilt, he sends a note to Dorothy stating he is an imposter and will impose on her no longer. Dorothy is crushed. Distraught, she decides to spend the night alone at Menford Manor, which her father has now purchased - still not realizing Menford and the Dr. Scott they have been seeing are the same person. As she is in bed that night, Menford arrives, intoxicated, and comes into her bedroom by a ladder at the balcony. Hiding under the covers, she does not know who this man is, but, later, when they realize each other's identity, she throws him out of the room. The next morning, a series of misunderstandings begins and increase in number and pace as the day goes on. First the butler assumes they are married and sets breakfast for two on the balcony. After they agree to keep the previous night a secret, a friend arrives, and Menford tries to delay suspicion by saying they're married. When they butler hears this, he tells the mailman, and the mailman tells the whole village. Father arrives, and they must also keep up the pretense with him. The day ends well, though, as they agree that the best thing to do is get married the next morning - especially after Menford admits that he "loves" her. Unfortunately, as they are waiting for the vicar the next morning, the money-hungry Diamond arrives and happily shares with Menford his research on all of Dorothy's assets. Menford is fearful of Dorothy finding out and hopes to get Diamond out of the way before the vicar arrives. However, Dorothy hears the conversation, gives Menford his hat and cane, and goes back to her room to cry. Although all seems lost, as with any romantic comedy, the two resolve their problems and return to each other's arms - much to the delight of Dorothy's father. "Her Night of Romance" is one of four Talmadge (two Norma, two Constance) feature films brought to silent movie fans from great quality prints with superb music scores by Kino International. Each DVD is a double feature with "Her Sister From Paris" (1925) teamed with our feature film on the Constance Talmadge disc, and Norma Talmadge's double feature disc including "Within the Law" (1923) and "Kiki" (1926). "Her Sister From Paris" is generally considered the better film and typically gets more attention; however, "Her Night of Romance" is no second-rate picture and deserves credit as one of Constance Talmadge's most enjoyable films - an engaging 85 minutes of bright, saucy, feel-good entertainment. Before going any further, though - and without taking anything away from the wonderful comedic talents of our heroine - it must be noted that the quality of this film is due to a team effort - namely the pairing of Talmadge with Ronald Colman. Colman is no doubt best remembered for his very successful career in sound films, but his career in the silent period is distinguished, as well, with such films as "The White Sister" (1923) and "Romola" (1925) with Lillian Gish, Ernst Lubitsch's "Lady Windemere's Fan" (1925), "The Sporting Venus" (1925) with Blanche Sweet, "Stella Dallas" (1925) with Belle Bennett, "Beau Geste" (1926), and "The Winning of Barbara Worth" (1926), one of several he made with Vilma Banky. It is interesting that on the two Talmadge discs released by Kino, Colman co-stars in three of the four films returning to co-star with Constance in "Her Sister From Paris" and also co-starring with Norma in "Kiki." Actually, Talmadge and Colman were reteamed in "Her Sister From Paris" because their pairing in "Her Night of Romance" proved to be so popular with the fans - as confirmed by the letters that poured in to First National for another film starring the couple. Talmadge liked Colman and praised him in a 1926 interview when she said, "He forced me to give my very best, not by any overt or direct means, but because working opposite him always proved so galvanic that one was shamed into doing a little more with one's character than usual." And certainly, one could ask for no better performance from the two stars than is seen in "Her Night of Romance." Not a particularly strong storyline, it was written by one of the silent era's most adept screenwriters, Hans Kraly, who was skilled at this kind of romantic farce (His credits are varied and noteworthy: "Mary Pickford's "Rosita" (1923), Rudolph Valentino's "The Eagle" (1925), Norma Talmadge's "Kiki" (1926), the Ramon Novarrro and Norma Shearer pairing in "The Student Prince of Old Heidelberg" (1927), Corinne Griffith's "The Garden of Eden" (1928), Greta Garbo's "Wild Orchids" (1929), among others.) Based on a series of misunderstandings, as one would expect, the film, nevertheless, keeps the viewer entertained and engaged as the romance between the two main characters blossoms but is frustrated by circumstances in and out of their control. For example, Menford chooses to pose as his uncle/doctor - a risky decision. Admittedly, this provides him a way to meet Dorothy, but he seems to have given no thought regarding his position if the relationship were to develop. Of course, we don't care about that stuff, because this situation naturally lends itself to some great comedy scenes. One of the best scenes . . .
One of the best in the picture is Menford's first visit to Dorothy as the doctor. Somewhat tentatively, he enters the room where she is lying in a divan, eyes covered with a cloth. "OK, doctor. You can examine me here," she says extending her arm but keeping the cloth on her eyes. With great reluctance, he gingerly takes her wrist between his fingers as if taking her pulse. She removes the cloth - sees that this is the same man who helped her at the boat dock - and her expression brightens immediately. Suddenly she is very interested in the examination. "What do you think of my pulse?" she asks, eyes alit. "I like it," he says with an obvious lack of medical knowledge. "My heart feels bumpy - please listen to it," she says almost seductively. Menford's nervousness has suddenly been raised several levels, and he responds, "If you insist, I will - but it looks alright to me." He tells her he must get his instruments from his bag - obviously hoping to find a stethoscope in it. Unfortunately, when he opens the "medical-looking" bag, there are shirt collars, toiletries and other items there. This is NOT his uncle's medical bag! Again, very nervously - trying to maintain the ruse of being a doctor - he says, "I'll use my ear." The scene is not without a certain sexiness to it as Dorothy pulls back the edge of her robe and Menford very slowly, cautiously and nervously gets close to her chest to listen to her heartbeat. This is the type of scene where Constance Talmadge shows not only her superb comedic ability, but her acting talent, as well. She is equally nervous as her chest heaves and her eyes dart back and forth trying not to look down at the doctor - awaiting his next move. Of course, the scene is handled very properly, albeit suggestively, as Menford never really places his ear on her chest, but happily stands up and reports, "Little lady, if I know anything about hearts, yours is perfect." Overjoyed, she gets misty-eyed and lays her head on his chest. Constance Talmadge is also an absolute joy to watch in the nighttime scene at Menford Manor. Her father has purchased the manor, although they have not moved in yet. She has just received a letter from Menford admitting that he is not a doctor and (honorably) saying he will not impose on her any longer. Dorothy wants to be alone in her grief, so she leaves a note for her father that she is going to Menford Manor to spend the night. This sets the scene, so it's not difficult to determine that somehow the paths of the two lovers will cross at the Manor - as they do. Dorothy's in bed asleep. In the wee, small hours of the morning, a taxi mistakenly lets Menford off at the Manor - intoxicated. Dorothy is suddenly awaked by a noise. There is a ladder at her balcony. She hides under the covers as a shadow enters her room. When next she looks from under the covers, she sees the back of a man on the foot of the bed removing his coat. She quickly pulls the covers over her head again. We then see Menford drunkenly trying to remove his shoes. One comes off easily. The other requires some tugging, and when it suddenly slips loose, he falls back on the bed. Dorothy screams, throws the covers over him, and runs to the next room. Neither has yet to discover the other's identity. We see Dorothy lock the door and place various pieces of furniture against it. Not surprisingly, Menford walks out into the hallway and enters the room from another door. He flips the light switch, Dorothy turns, screams and faints. Unable to revive her, he picks her up to return her to her room but trips as he is entering the doorway. She awakens. He tries to explain, and she refuses to listen, throwing him out of the room. As he sits in the hallway, he suddenly sees her door open, and she tosses out his coat, hat and cane, as well. The entire sequence is hilarious and is made so by the artful facial expressions - natural as one would expect in such a situation - by Talmadge and Colman's restrained portrayal of someone who is intoxicated. The sequence ends with one of the film's most charming bits of business for which Kraly and/or director Sidney Franklin deserve much credit. Dorothy has returned to the room to cry after throwing out Menford's things. However, we can't see her face. She has fallen to the floor near the foot of the bed - obviously with her face and arms on the bed - but all we can see are her legs folded back, the rest of her body hidden by our vantage point from the foot of the bed. The low shot shows three shoes in front of her legs - a pair of her shoes and one shoe left by Menford. A hand emerges from the around the leg of the bed - feels its way forward and disovers Menford's shoe. The hand then slowly draws the shoe back around the leg of the bed and out of our sight. A tender gesture that conveys so much. One of the challenges a writer faces in constructing a film such as this - one that is built on misunderstandings and a series of situational snafus - is bringing it to a climax that rivals what has gone before. "Her Night of Romance" does that successfully, not with one seemingly impossible situation, but with several - each one building on the other. First, after the previous night's disastrous encounter, Dorothy comes down to find breakfast on the terrace set for two. When Menford arrives, Dorothy tearily cries, "What must the butler think of me?" Menford assures her no one will know they were in the house together the previous evening when suddenly a friend, Sir John Patchwood, arrives. As Dorothy becomes even more mortified, Menford decides the best tactic is to introduce Dorothy as his wife. The butler hears this as he is delivering breakfast and drops they tray of food in his excitement. As he is congratulating Menford, the mailman arrives, and, unable to contain himself, the butler tells the mailman the good news - at which point the mailman reports he will announce the marriage to the whole village. In tears, Dorothy runs from the terrace to her room to pack. To compound the problem, Adams arrives to check on his daughter, and they must continue to ruse with her father. It's all very comical, but quickly turns serious (all good comedy has a touch of drama in it) when Diamond arrives and congratulates Menford - quick to remind him of their agreement that Diamond will receive 10 percent of any assets realized from the union. And what else can we expect to happen - of course! Dorothy was at the door and heard everything. So, she now realizes the whole thing was a set-up to get to her money. Again, Talmadge's acting abilities come through as she begs Colman to throw this "trickster" out and deny that it is true. In his shame, Menford can only look down without speaking. The two are complemented well by Jean Hersholt's playing of the mercenary Diamond, especially in this scene. He is almost rat-like as he peers through the narrow glasses with bent shoulders - he evokes a despicableness that just right for the situation, even throwing his head back in a laugh when Dorothy walks out and Menford stands dejected and crestfallen at the sudden loss of happiness on what was going to be his wedding day. So, how is all of this resolved and the two reunited? Of course it is and they are, but you'll need to watch the movie for that. The film does end with a very charming closeout which bears recounting. All has been resolved, and the father is looking out a window to the balcony below. The camera assumes the position of the father looking down as Dorothy emerges from the room where the lovers have just made up. She looks up at the camera, smiling happily, and tells her father all is well. An arm extends from the room, and pulls Dorothy back in. As we come to the final fade-out, we see the light from the room cast two shadows onto the balcony floor, first in an embrace, then a kiss - a scene that not only satisfies but promises to bring a smile as "The End" appears on the screen. As it should be, "Her Night of Romance" (which, by the way, came out a few months prior to "Her Sister From Paris") received positive reviews. The hard-to-please New York Times' Mordaunt Hall (Jan. 13, 1925) said it is "a lively pictorial farce-comedy" that "is jolly enough to cause one to forget the winter's snow and chilling blasts." In praising the principals, he said, "In this vehicle, Miss Talmadge is gay and charming, affectionate and coy, always making the most of her expressive eyes. Ronald Colman. . . . gives an easy and natural performance. . ." Both Jean Hersholt and Albert Gran (as her father) were praised, as well. Variety (Jan. 14, 1925) said, "'Her Night of Romance' proves to be one of the most delightful of the comedy-drama type of pictures that Constance Talmadge has starred in in some time," adding, "Ronald Colman is possibly the best leading man she has had in some time." More reserved in their praise, Harrison's Reports (Nov. 29, 1924) said, "A fairly good farce-comedy; it isn't a knockout, it does not provide any side-splitting laughter, but it does manage to keep along on an even keel and, though padding is noticeable in places, the picture does not become tedious." Photoplay (February 1925) simply said, "This is decidedly Constance Talmadge at her best." 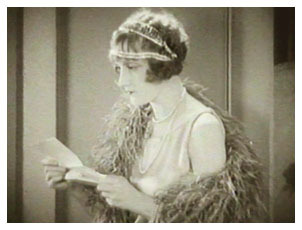 "Her Night of Romance" is typical Constance Talmadge, and anyone who sees one of her comedies will instantly fall in love with her. ("The Primitive Lover" (1922), "The Duchess of Buffalo" (1926), and, of course "Her Sister From Paris" (1925) are easily found on video.) She sparkles on the screen and emanates an effervescence that is sure to bring a smile - and her carefree, coy and come-hither characterizations are innocently tantalizing. Kino's double feature - "Her Night of Romance" (1924) and "Her Sister From Paris" (1925) is a sparkling DVD gem - and who wouldn't want to own a sparkling gem?